I’ve just got round to re-basing all my 28mm Plastic Napoleonic figures I use for Sharp Practice (Twofatlardies). They include Spanish Guerrillas, Spanish line and grenadiers, British Line and 95th, and French line, Voltigeurs and Grenadiers. About 300 figures in total. The bases allow me to use them in formation – or taking them out of the bases as groups. Cavalry to do next. Edit – I should of course say these are a mixture of Perry and Victrix – the Spanish are converted French 1804- Victrix – (the box with bicornes) – I converted the Grenadiers by rebuilding the bearskin. The Spanish Guerrillas and the 95th Rifles are Front Rank metals (large 28mm). 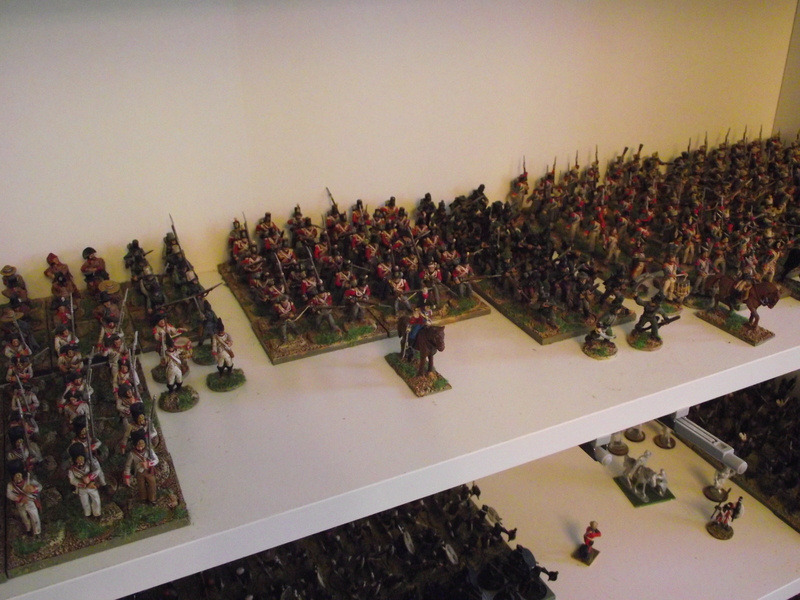 It isn’t the greatest picture – it shows them on my storage shelves – underneath you can just see my ‘Generic Natives’ 28mm force. I’ve realised I have as many again to build/paint, including Prussians (! ), and some British Marine heads to convert the Victrix British Infantry to Marines for Boarding parties – not sure I am ever going to get these done! !